Carpenter ants are the most commonly encountered wood destroying insects in the Pacific Northwest. They are responsible for damage to thousands of homes each year. The damage can be limited, or it can be extensive, costing thousands of dollars to repair the home or commercial structure. Therefore, it is important to protect houses and other structures from these ant pests. But first we need to know something about carpenter ants in order to understand the control strategy. Proper insect identification is an important first step to avoid unnecessary treatment and expense. Carpenter ants have certain distinguishing features but vary somewhat in size and color. In all cases they have black heads and abdomens, but the thorax can be black or dark red. 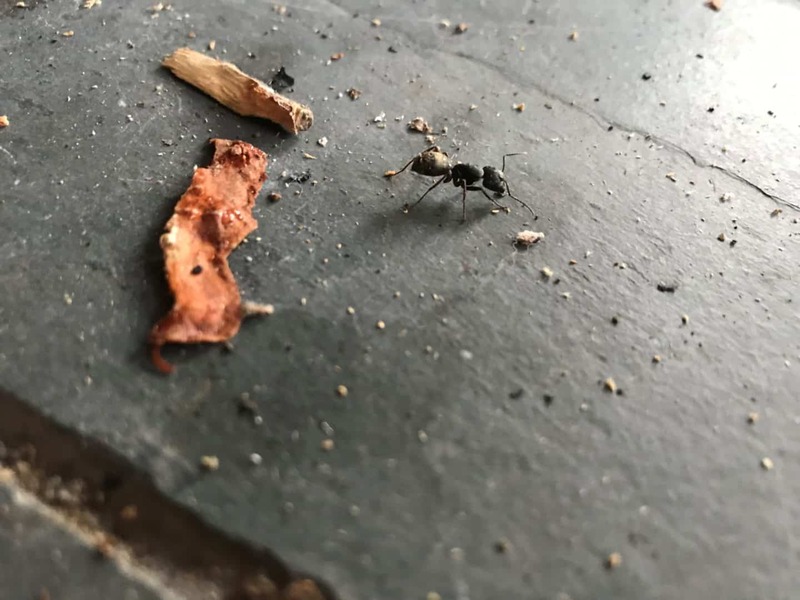 Since there is such variation in color and size it is best to send a photo of the ants you’re encountering to Cascade’s office for assistance. Carpenter ants prefer to nest in wood. In forests such nesting is beneficial as it helps return dead wood to soil. Unfortunately, carpenter ants view a wood-framed house as nothing more than a uniquely arranged woodpile. A colony of carpenter ants may number up to 70,000. What makes the control of carpenter ants rather challenging is the fact that they will divide their colony population amongst as many as 12 different nest sites. The ants of the colony communicate with each other between the various nest sites. The distinct nest sites of one carpenter ant colony can be located as much as 300 feet apart—so a colony may be spread amongst several homes in a given neighborhood. And it is common to have several different ant nests in a home or other structure. One of the nests contains an egg-laying queen who (at least in the warmer months) continually repopulated the entire colony. This “parent” carpenter ant nest site is always located in wood with a high moisture content. As a result it is often found in logs, stumps and trees. In contrast, the “satellite” nests do not contain queens, though they may have larvae brought to them for incubation. These ‘satellite’ carpenter ant nests are often located in dry, sound wood. These are typically the type of carpenter ant nest(s) found in homes. One or more nests can be located anywhere within the structural framing, including the walls, floors, crawlspaces, attics, as well as within insulation and roofing materials. Since the parent nest is outside, merely ‘killing a nest’ inside seldom solves the problem. What to Look for in Your Home — Most carpenter ant movement occurs at night. Although carpenter ants destroy wood by excavating nests they do not eat wood. Carpenter ant workers exit the nests and forage for food—on the ground, on shrubs, and on trees. They eat other insects and grubs, and often high up in trees they “milk” aphids for a sugary liquid known as “honeydew.” Most foraging occurs at night, however, it is their limited daytime activity that is most noticeable to us. Finding the sawdust-like ‘frass’ produced by carpenter ants is dramatic. However, this is very uncommon being that carpenter ants are usually nesting within the framing of the home or other building and the frass gets deposited within walls or other voids hidden from view. Another sign is the presence of winged “swarmers.” These winged, sexually mature males and females venture from their nests in or around June each year. A good number of carpenter ant swarmers may indicate an infestation…but if it’s just one or two they probably flew in from further away. A “red alert” is the presence of ants indoors. Since carpenter ants don’t look for food inside a home, any such indoor activity indicates an infestation within a nearby wall, flooring or other part of the structure. Nevertheless, carpenter ants seldom travel indoors so infestations often go unnoticed for years. Carpenter ants typically nest in homes and go outside to forage for food so they are rarely seen indoors. It is best to look for the presence of carpenter ants outside the home amongst the landscaping, etc. Outside we have a chance to notice where the carpenter ants are foraging for other insects to eat. Such outdoor activity may be on the ground, on decks and patios, along fences, on tree branches which tough the house or roof, or going up and down large trees within 100 feet of the home. Occasionally carpenter ants are found traveling along phone or power lines from the house roof to a utility pole. Cascade Pest Control has 40 years’ experience controlling and preventing carpenter ants for homes and businesses.